Can a Dzu-Teh Glacier Traverse across several Glacier Mountains in one turn if they are all connected? If a Dzu-Teh is engaged to an opponent’s figure, and uses Glacier Traverse to leave the engagement, is it subject to a passing swipe? As a Squad that follows Jandar, Dzu-Teh figures may benefit from Sir Gilbert's JANDAR'S DISPATCH movement bonus. As Hunters, Dzu-Teh may receive an additional attack die when adjacent to Arktos. Traverse How Many Glaciers Per Turn? Last edited by superfrog; March 11th, 2019 at 02:14 PM. I really think their power ranking is too low. On an ice map (the only map they should be played on, in my opinion) they deserve a B+ at least. These are not figures for pre-made armies or tournaments unless you have seen the map and it is mostly snow/ice. They are draft figures for ice maps, period. I think taking that into account is a good idea for the rankings. If you're only playing figures on maps that benefit them, then you should give everyone a grade boost. C+ is fine for the Dzu-Teh. Again, as I said on the Obsidian Guards thread, Spider Poison designated the rankings, and I believe did so with versatility in mind. A squad that is only useful on one terrain type is not all that great. Look at figures like NERAK and BRUNAK that are better on specialized terrain, but are still viable choices on standard boards. The ranking I think reflects the OVERALL effectiveness of the piece. I still disagree. Dzu-tehs and Obsidians are terrain-specific figures, and should not be graded off of their terrain. Sure other figures have situations in which they are more effective than others, but there are no figures in the game other than Dzu-tehs and Obsidians that are truly tied to one terrain type or map layout to the same extent. Grading them off of that terrain seems silly to me. I guess, bottom line, it bothers me that people bash specialists. Dzu-tehs are good at what they do (fight on snow and ice), and good at nothing else. That doesn't make them average or poor. How many armies can you build with Dzu Teh? Would you ever play it without snow on the ground? I would say NO. Therefor the DISADVANTAGE of being terrain specific earns it a lesser rating. If I am going to grade Dzu Teh for snow only then we should grade all the other figures with a separate snow ranking...or how about lava...or boards that favor melee. Heck a lot of units would be MUCH better on melee favoring boards. That might be interesting to make terrain specific (lava, snow and ice, castle, road) rankings - though mostly maps are not an abundance of one terrain and the number of figures that wouldn't be largely changed in their rankings based on terrain would probably make it a lot of work for little pay off. As it is, I believe Spider's rankings are meant to be for competitive armies (i.e. tournament armies). If you're looking for casual play (can still be competitive, but not exactly tourney worthy), then the ratings of terrain specific units like these guys and the Obsidians would go up. But if you're going for tourney worthy, like Spider is, I believe, the lower ratings make sense. If I have all my Dzu-Teh adjacent to glaciers, can all of them glacial traverse during a squad's activation? I know there are only three to a squad, but the cards says "any or all Dzu-Teh you control". Whattaya think? Have I had one too many Mojitos? They do have a nice attack, though. If you want the opposite of Tarns/Knights with 4/3 attack/defense, they aren't bad. The official answer to a similar Shades of Bleakewood question confirmed that you may roll for Possession for all Shades you control, even if you have 30 of them! That seems to set a precedent here. Also, the card could have said, "for any or all Dzu-Teh you activate" but it didn't. Still, the spirit of the game suggests you are limited to those three you activate. I believe the official ruling will be "all of them" but that people will probably play allowing just the three (which is what I've always done before reading this post). Ah, I should have continued my quote a little further. Would help me see the light. Thanks, Gamjuven. 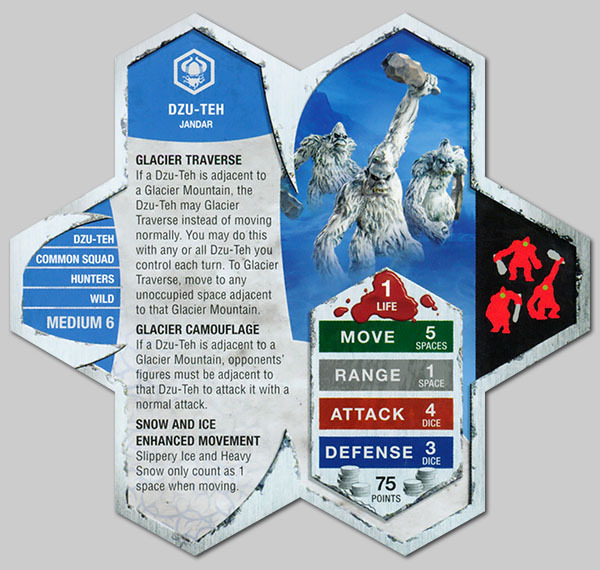 I think it would be sheer awesome to Glacier Traverse with ALL Dzu-Teh adjacent to glaciers and in the spirit of having a substantial-sized army of one common unit, but I think it'll just be three Dzu-Teh.